On April 9, the Moderate Resolution Imaging Spectroradiometer or MODIS instrument aboard NASA's Terra satellite provided a visible image of Wallace. Wallace's center was over the Southern Indian Ocean and well off the Pilbara coast of Western Australia. Northwesterly winds were pushing the bulk of Wallace's clouds southeast of its center. Wallace's southeastern quadrant was spreading clouds along the Pilbara coastline of northern Western Australia from Exmouth north to Port Hedland. Clouds were being pushed far inland and were streaming over Karijini National Park. The park is a large wilderness area in the Hamersley Range of Western Australia. 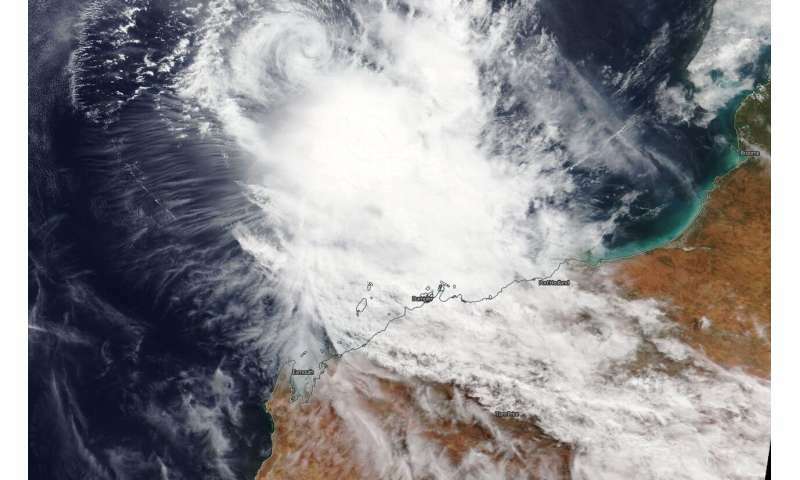 At 8 a.m. EDT (8:00 p.m. AWST local time), the Australian Bureau of Meteorology or ABM reported that Tropical Cyclone Wallace was located near 16.5 degrees south latitude and 113.9 east longitude. That is 560 km north-northwest of Karratha and 610 km north of Exmouth. Wallace was moving west-southwest at 7 kilometers per hour. Maximum sustained winds were near 45 knots (52 mph/83 kph). ABM said "Tropical Cyclone Wallace will continue to weaken as it tracks westwards. Wallace is forecast to be below tropical cyclone intensity by Wednesday [April 10] afternoon.